Description: This woody perennial vine is up to 40' long, branching occasionally. It usually climbs over small trees, shrubs, or fence rows, otherwise it sprawls across the ground. A mature vine will develop a woody base with shaggy bark; younger branches are more slender and less shaggy. 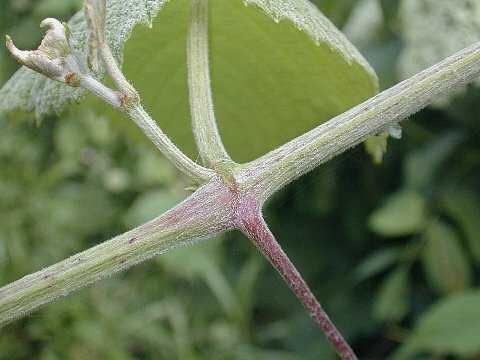 The non-woody branchlets are more or less covered with appressed hairs that are white or grey; these branchlets are often irregularly angular. The alternate leaves are up to 8" long and 6" across, although they are usually smaller. A typical mature leaf is cordate-orbicular in shape, dentate along its margins, and deeply indented at its base. The upper surface of this leaf is dull green, while its lower surface is densely covered with white cobwebby hairs that. A typical immature leaf is densely covered with white cobwebby hairs on both surfaces; its lower surface is often conspicuously white. The leaves are often divided into 3 lobes that are shallow and broad; they never have deep lobes. 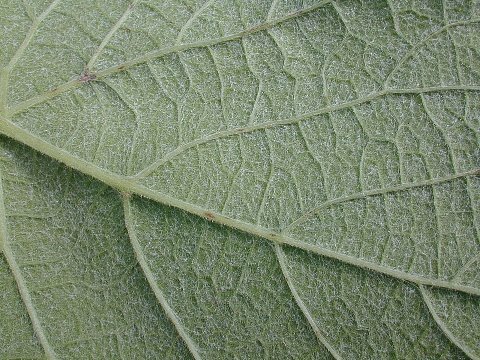 The petiole of each leaf is quite long and more or less covered with appressed hairs like the branchlets. Across from each leaf (except every third one), there is a single tendril and a multiple panicle of flowers or fruits. The flowers are produced in drooping panicles up to 9" long and 4" across.The small flowers are yellowish green, consisting of 5 petals, 5 tiny sepals, and 5 stamens. These flowers can be perfect (bisexual), staminate (male), or pistillate (female); sometimes the staminate and pistillate flowers occur on separate plants. The blooming period occurs during the late spring and lasts about 2 weeks. There is a strong floral scent that is quite sweet. Each pistillate or perfect flower is replaced by an ovoid fruit containing 1-3 brown seeds. Initially this fruit is small and green, but it eventually becomes larger (about 3/8" or 1 cm. long), juicy, and black. The black surface of the fruit lacks a whitish bloom. The fruits of Winter Grape are sweet-tart when mature and edible. Each seed is 3-5 mm. in length. The root system consists of a taproot that is branching and woody. This plant spreads by reseeding itself. Cultivation: The preference is partial sun, moist conditions, and a fertile loamy soil. Like other Vitis spp. (Wild Grapes), the foliage is vulnerable to various pests and disease. Under favorable conditions, the growth of this vine can be rampant; it can smother and kill small trees and shrubs. Range & Habitat: The native Winter Grape occurs occasionally in southern and central Illinois; it is uncommon or absent in the northern portion of the state (see Distribution Map). Habitats include openings in moist woodlands, areas adjacent to woodland paths, partially shaded riverbanks, thickets, fence rows, and powerline clearances in wooded areas. This species usually doesn't wander far from thickets or wooded areas. Faunal Associations: The flowers attract bumblebees and honeybees, which collect pollen. Many kinds of insects feed on various parts of Vitis spp. (Wild Grapes), including thrips, aphids, leafhoppers, leaf beetles, flea beetles, and the caterpillars of numerous moths (see Moth Table). In some areas, the introduced Popillia japonica (Japanese Beetle) can cause major damage to the foliage of both Wild and Cultivated Grapes. The ripened fruit is very popular with many upland gamebirds and songbirds, particularly those that inhabit shrubby or wooded areas (see Bird Table). The fruit is a food source for several mammals, including the Black Bear, Opossum, Raccoon, Eastern Skunk, and Fox Squirrel. White-Tailed Deer browse on the foliage & shoots to some extent. The dense climbing foliage of Wild Grapes provides cover and nesting habitat for many species of birds; it also provides shelter for small mammals. In general, the ecological value of Wild Grapes to wildlife is quite high. Photographic Location: Photographs of the foliage were taken along a path in Busey Woods, Urbana, Illinois. The photograph of the flowers was taken at a woodland border in Pope County of southern Illinois. Comments: Winter Grape is one of several native Vitis spp. (Wild Grapes) in Illinois. 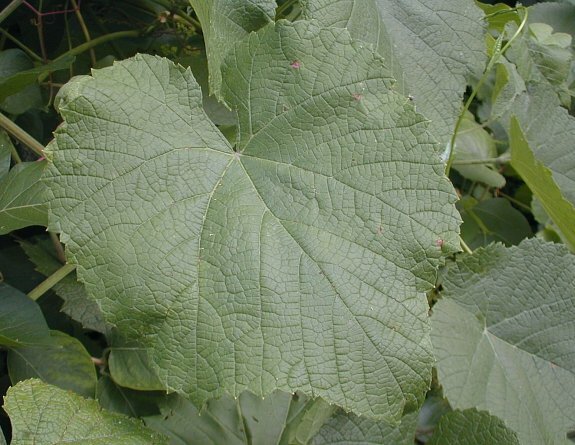 It can be distinguished from most species of Wild Grape by the cobwebby hairs on its branchlets, petioles, and leaf undersides. 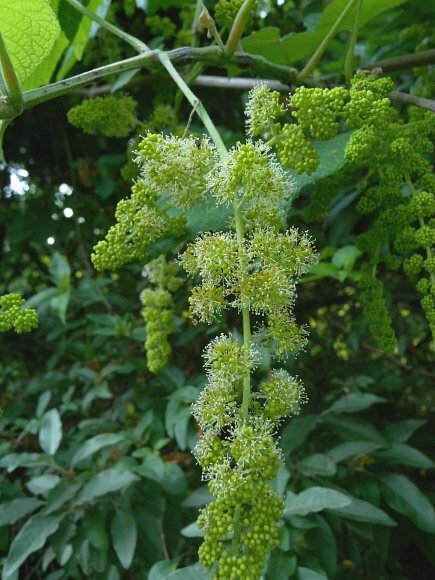 A notable exception is Vitis aestivalis (Summer Grape), which also has cobwebby hairs, although they are usually less dense and conspicuous. The leaves of Summer Grape occasionally have deep lobes, while the leaves of Winter Grape never have deep lobes. The branchlets of Summer Grape are round in circumference, while the branchlets of Winter Grape are usually angular. The seeds of Summer Grape are somewhat larger in size (5-8 mm. in length) and the surface of its fruit has a whitish bloom. Winter Grape has seeds that are only 3-5 mm. in length and its fruit lacks a whitish bloom.